The big Honda is capable of pushing the 6.4m Sea Nymph to speeds in excess of 40 knots. The recommended power range for the boat is 120-225hp and the Honda 225 is right up there in terms of sensible power input. 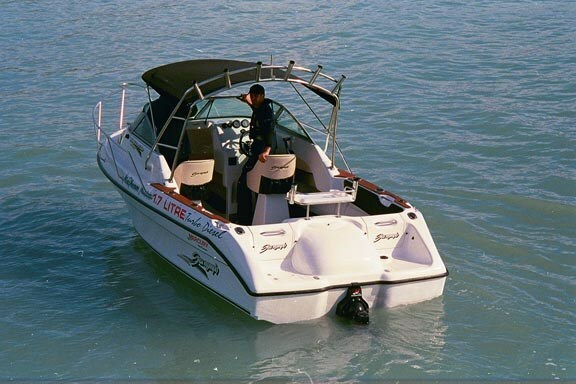 McPherson Marine in Christchurch is one of the city’s leading marine dealerships, and is also one of its principal Mercury/Mercruiser dealers. It stands to reason then that the company sought to power one of its Sea Nymph 640 Blue Water Fishers with a Mercury product. 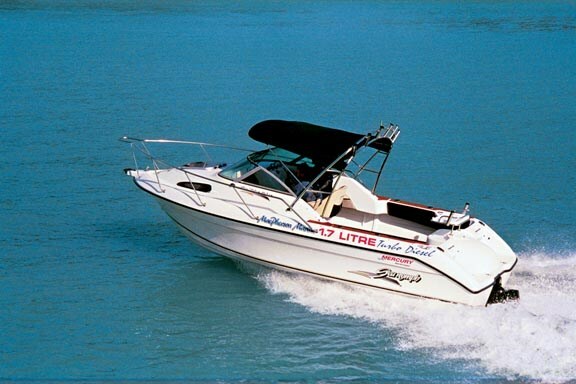 Given the rapidly inflating cost of fuel and the reasonable probability that petrol will cost in excess of $2.00 per litre by Christmas, it made perfect sense to showcase the Mercruiser 120hp turbo-diesel sterndrive. While clearly unable to provide the outright top speed capability of a big outboard engine – two or four-stroke – the turbo-diesel option has a trump card in its hand – fuel economy. 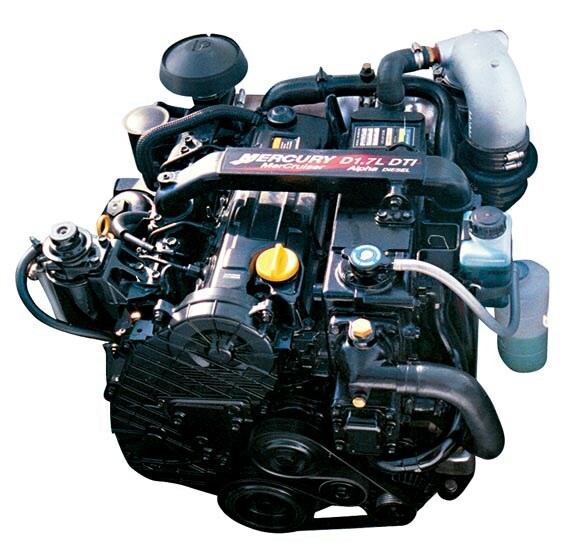 Under a variety of sea conditions and in various hull forms, the Mercruiser 1.7-litre, 120hp turbo-diesel engine has demonstrated a consistent and miserly fuel consumption – as low as nine litres per hour. In this day and age, such economy is not to be ignored and many users have demonstrated that they are prepared to make some sacrifices for this level of economy. One objection often put up against the use of stern drives (or any inboard engine configuration for that matter) is that the engine intrudes into the usable space of the cockpit. Well, in the case of the Mercruiser 1.7 turbo diesel, this is hardly a valid argument. Mounted as it is in the Sea Nymph 640, the comparatively short length of the compact, in-line four-cylinder engine means there is minimal loss of cockpit space. The neat, two-piece engine cover blends nicely into the lines of the transom and still provides excellent access for servicing. The sterndrive installation also provides a cleaner transom to this reviewer’s eye than many outboard motor installations. We experienced the boat on the choppy waters of Lyttelton Harbour which had been stirred up by a stiff easterly breeze. The handling of the hull is sure and predictable. Despite the strong wind we noted the windscreen on our boat remained free of spray most of the time. 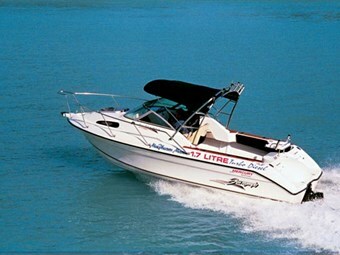 The Mercruiser Alpha 1 drive is usually fitted with a 23" Black Max alloy prop as standard. However our review boat had a stainless steel 23" Vengence propeller fitted which seemed well matched to the torquey nature of the turbodiesel engine. There was a little black smoke evident from the exhaust on start up, more noticeably when the engine was cold and this left its telltale smudge along the transom. At low engine speeds – less than 1500rpm – the typical diesel chatter is evident along with a little coarseness that is typical of its in-line four-cylinder configuration. But, the engine certainly does feel purposeful and is not offensive.When the throttle is opened from low speed, there is some hesitation while the turbo spools up, but once the tacho needle passes through the 2000rpm mark, there is a progressive flow of torque as the engine "comes on boost". There is more than enough punch on offer to facilitate the towing of a waterskier and water toys for family recreational use. The engine has a real sweet spot around 3200-3400rpm and when the throttle is opened from this speed, there is no hint of turbo lag at all, just a surprisingly satisfying surge forward given the relatively small displacement of the engine. We found the engine would pull 4200rpm at wide-open throttle and this translated to a GPS indicated speed of 64kph. The nicest cruising speed seemed to be around 48kph at 3400-3500rpm. There is no doubting that there is some sacrifice in terms of smooth, quiet and powerful performance if the Mercruiser 120hp turbodiesel sterndrive system is selected over outboard and/or petrol sterndrive installations. As the price of petrol continues to soar, such sacrifices become more acceptable when considered in the light of the frugal manner in which the Mercruiser consumes its fuel. We feel the Sea Nymph 640 as reviewed would benefit greatly from engine noise suppression material being installed around the engine compartment. In terms of the intended use of the Sea Nymph 640 Blue Water Fisher, the Mercruiser 120hp turbo diesel sterndrive has much to recommend it.